The Hardest Working Model at ModCloth ← You Want Me To Wear What? « Ready to Feel Old? 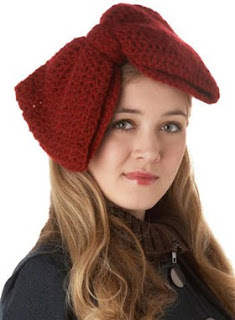 She is wearing a giant floppy knit bow, and yet, she is selling it. Not to me, obviously, but she’s selling it to somebody. I think. I mean, this is a giant, comically oversized bow. It’s so large, I’m actually a little worried it about where it falls on the food chain. * I want to say it’s hugging her head with its giant floppy bow arms, but I think it may be trying to devour her head. Which would be unfortunate, because I don’t think there’s any other model out there who can wear a hat as convincingly as she can. Should someone maybe check on her? *If you like things that are at the top of the food chain, you’ll love C-List Actors Save Us All, my new disaster and monster movie review blog! We have to redesign the material, and question some of the product categories. We want to invent our way out of this.